This is an indicator of "round levels" with a trading system module based on market scenarios near psychologically significant "market prices". 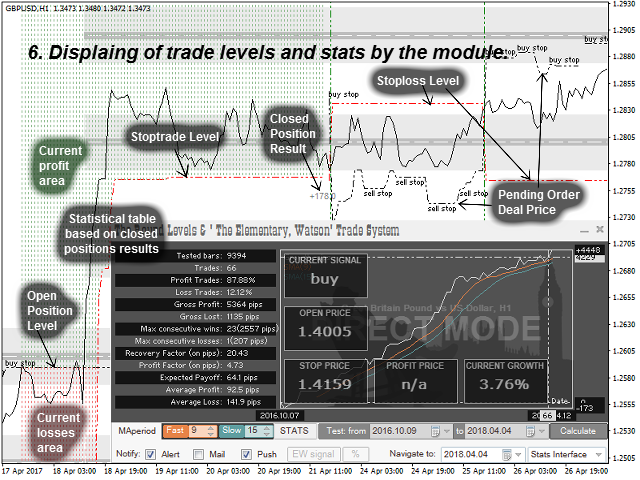 Visualizing the SL/TP levels and modeling deals when they interact with OHLC prices, the module collects statistics for the specified period and plots the "profitability curve" on its basis, which allows controlling the expected profitability of trading signals. 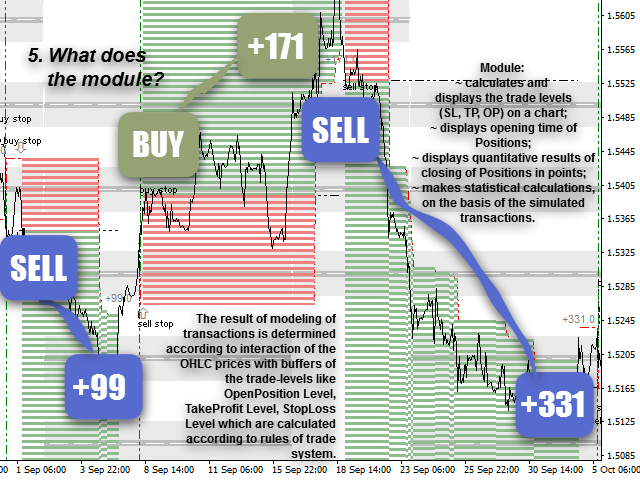 The algorithm is based on the trading system The Elementary, Watson! (EW) for GBPUSD H1, developed by Yuri Lozgovtsev, lecturer at International Academy of Investments and Trading. 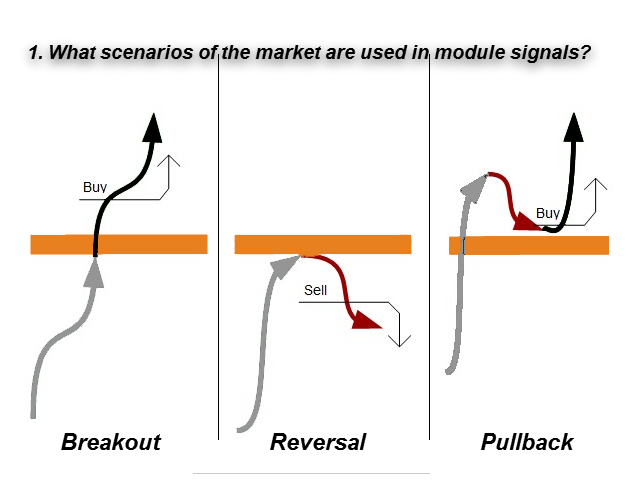 The rules of the system are based on 3 typical market scenarios: Rebound, Breakout, Pullback (screenshot #1). Price - Close price of the period/bar. 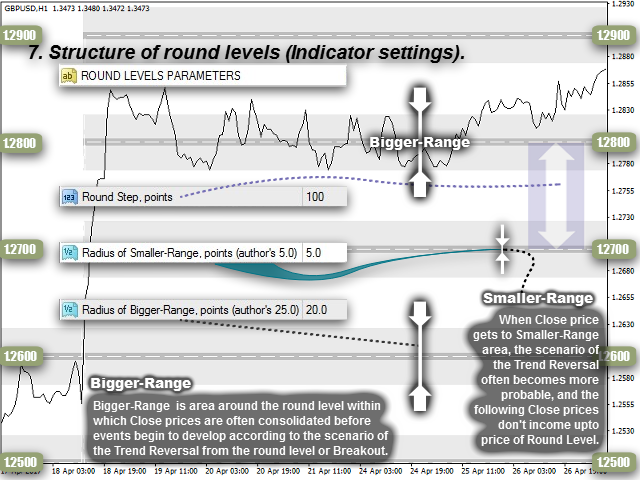 Each Level is characterized by the Low and High ranges, which define the boundaries where the price consolidates most often before one of the scenarios takes place. 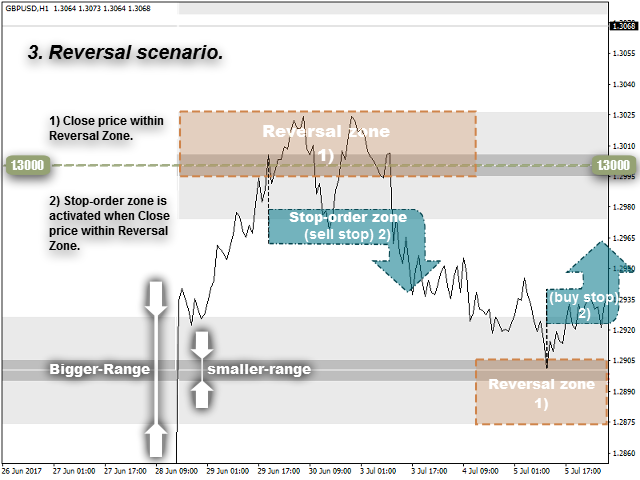 If the Price reaches the Level, falls within the Smaller range and can not break the Higher range, the System expects the Rebound scenario and places a stop order for a rebound (screenshot #3). 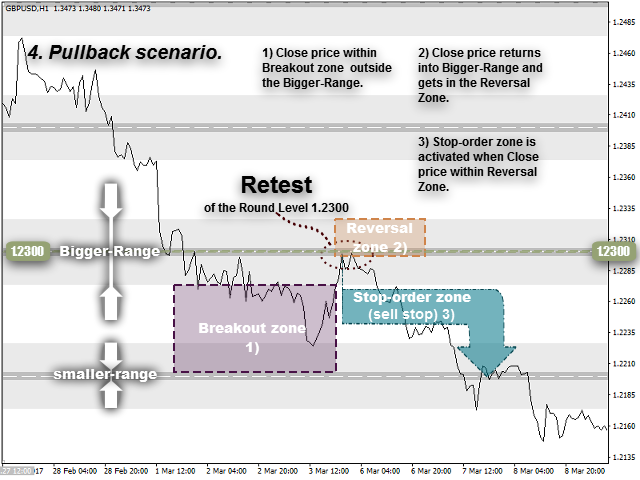 If the Price reaches the Level and not only falls within the Smaller range, but also breaks through the Higher range, the System expects the Breakout or Pullback scenario or its continuation and places a stop order for a breakout (screenshot #2) or for a rebound at a mirrored retest level (screenshot #4). 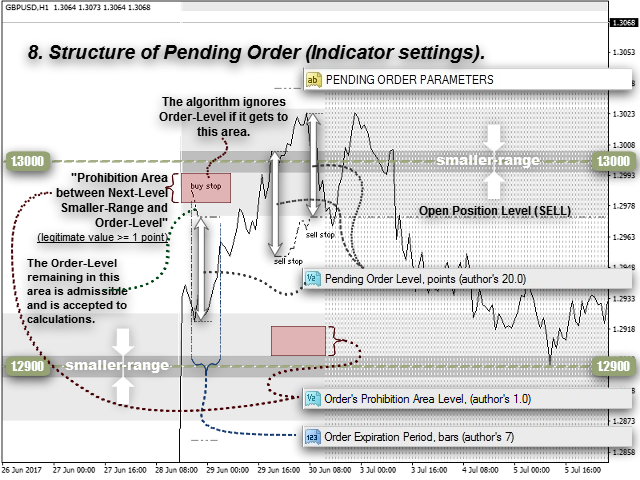 If the Order expiration time is reached, and a Position was not opened, the System deletes the Order and starts waiting for a new valid signal. If a Position is open, then only its further management is performed, other signals of the System are ignored. 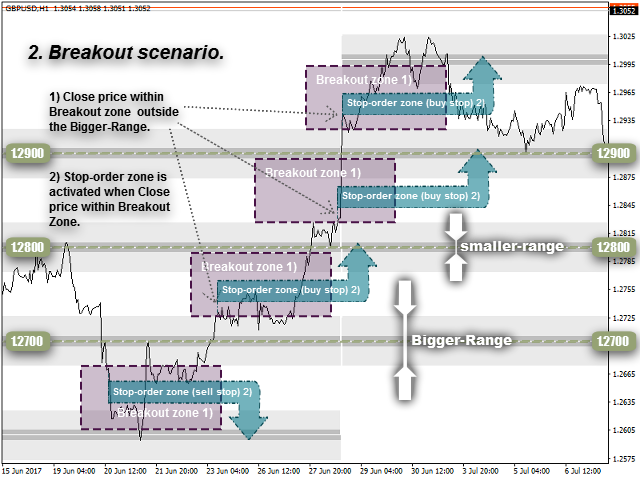 If the Position has been open for a long time, but no scenarios are developing on the market and the waiting limit is reached (the Open-Position Limiting-Period parameter), the System moves SL/TP of the Position to the entry price to close the Position at breakeven/parity. 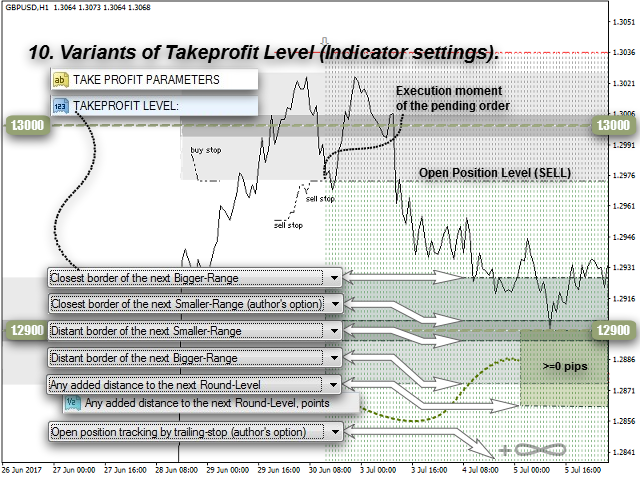 Take profit and stop loss parameters are almost always linked to the range boundaries of the adjacent Levels (screenshots #9,10). 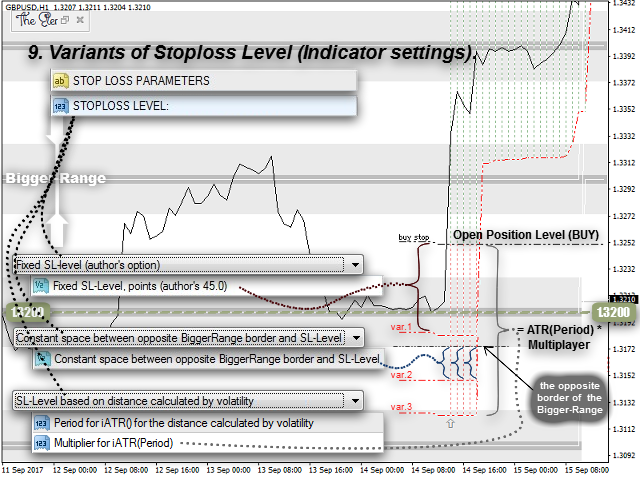 Constant space between opposite Bigger-Range border and SL-Level - parameter of the method "Fixed SL offset from the boundary of the Higher range"
Period for iATR() for the distance calculated by volatility - period of the iATR() indicator for the method "SL based on the volatility indicator iATR()"
Any added distance to the next Round-Level - parameter of the method "Any added distance to the price of the next round level"
Inverse direction of all deals? 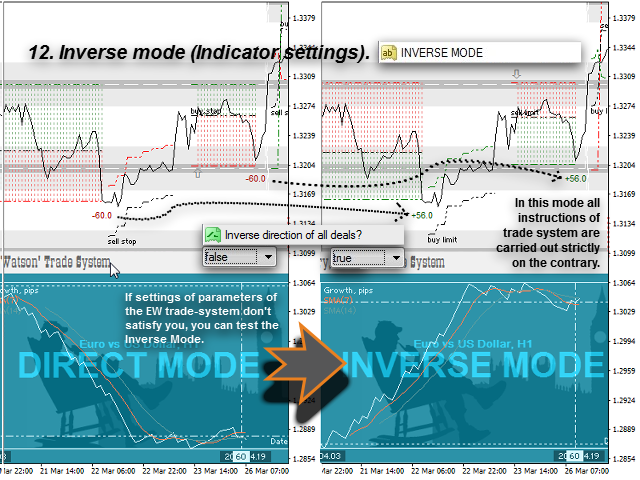 - enable/disable the inversion of "deals"
elimination of working with huge spreads. 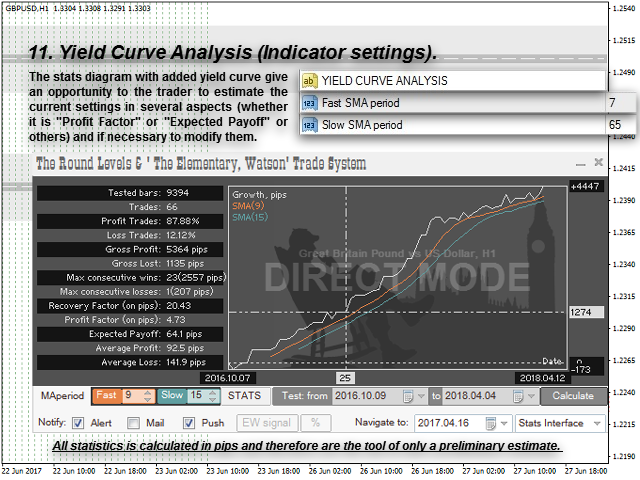 The indicator does not contain money management algorithms. Statistics (excluding swaps) is calculated in points. Due to this, the results are close to the fixed lot method.